Since they were the first African nation to qualify to South Africa 2010, we thought it fitting to have Michael Essien's Ghana be the first of the African nations' new jerseys we spoke of. Not only the new jerseys the Black Stars will wear for the African Cup of Nations 2010 in January, but other great gear the Ghana National Soccer Team will wear for World Cup 2010 - is here! The Official PUMA Ghana 10-12 Away Soccer Jersey is a thing of class and style. The Red & gold paintbrush stripes give it a unique edge. 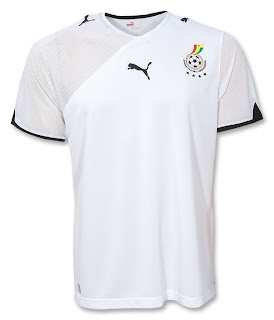 Official PUMA Ghana 10-12 Home Soccer Jersey. This white jersey with black trim features an innovative subtle star pattern on the right chest. 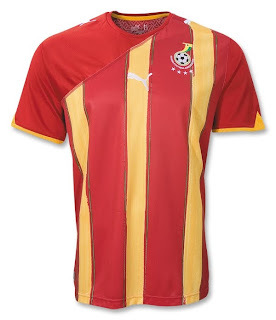 Like all the other new African nations' jerseys, these include a Kinte mesh back in honor of African football.